The U.S. healthcare system spent $3.2 trillion in 2015, or almost $10,000 for every person, according to the latest federal projections. It's a 5.5% increase from 2014—still a lot lower than the annual growth rates from decades ago, but a tick higher than the 5.3% increase recorded in 2014 and above the rates seen in the immediate aftermath of the Affordable Care Act and the Great Recession. Government economists also reaffirmed their prediction that national health spending will grow by 5.8% each year on average over the next decade. However, healthcare still represents an outsized part of the economy: 17.8% of gross domestic product in 2015, and that will increase to 20.1% by 2025, CMS actuaries estimated, as more people age into Medicare and need more healthcare. That has economists worried that not enough is being done to slow down healthcare spending, which averts funding from things like education and transportation. The 5.5% annual growth rate for 2015 appears to be “influenced by the persisting effects of the coverage expansion under the Affordable Care Act,” said Sean Keehan, a health economist at the CMS Office of the Actuary, which tracks the country's healthcare spending. The office's latest report was published in the journal Health Affairs Wednesday. Indeed, 2014 kicked off the full-scale rollout of expanded Medicaid eligibility for all people who earn up to 138% of the federal poverty level as well as the introduction of the state and federal insurance marketplaces. The exchanges have become financial headaches for many health insurers, though not all. Those two primary coverage expansions, along with sharp price hikes of prescription drugs, not surprisingly increased the country's healthcare tab in 2014. Year two of Medicaid expansion and the exchanges has brought about more patients who needed care, the federal data show. Healthcare spending will slow slightly this year and in other upcoming years as Medicaid and exchange enrollment eases, CMS actuaries predicted. The number of uninsured people also is not expected to decline as much as what has been seen over the past two years. But the relentless job growth in healthcare—the current hiring pace will put the industry at 900,000 added jobs in 2015 and 2016—has left some economists pessimistic that health spending will slow down in the near term. Getzen estimates that healthcare spending growth in 2016 and 2017 will actually be higher than what CMS actuaries predict because of the influx of jobs. “Just more people on the payroll means spending is up,” he said. It's also unclear how much the ACA's payment and delivery reforms have alleviated the healthcare system's problems. Some experts believe the “cost-saving components of the ACA” cannot claim much credit for the recent slowdown in spending. The CMS has enacted several programs—ranging from mandatory bundled payments to accountable care organizations—that essentially cap payments and require hospitals, doctors and other caregivers to deliver high-quality care in a coordinated manner. Private payers have pushed for similar reforms. Economists with the CMS Office of the Actuary could not definitively say how much those programs have affected the nation's healthcare bill over the past three years. “In terms of our ability to quantitatively estimate what that impact would be, we do not have that capability at the moment,” John Poisal, a deputy director within the CMS Office of the Actuary, told reporters Wednesday. 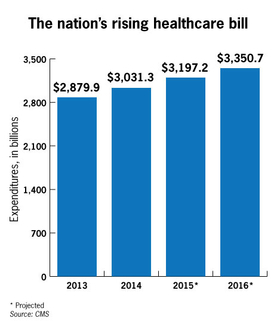 The higher healthcare expenditures in 2015 were tallied despite the fact that medical price inflation “continued to grow at a historically low rate of 0.8%,” federal economists said. Healthcare prices have been notoriously opaque and variable, leading to some calls for government price regulation as a way to reduce health spending growth. But that strategy has been a political nonstarter for many provider groups, as well as the drug industry. Instead, more households are paying for more of their healthcare out of their own pockets. Roughly 10.6% of national health expenditures came from consumers' wallets in 2015, according to federal projections. Employers and individual plans are pushing people toward high-deductible health plans, which require patients to pay more of their costs upfront. Jon Gabel, a senior fellow at the University of Chicago's National Opinion Research Center, said the rush toward high deductibles reminds him of a decades-old RAND Corp. experiment, which showed people reduced the use of both necessary and unnecessary healthcare services if they were on the hook for more of the cost. It reduces spending in the short term, but could lead to people requiring more expensive care down the line after putting off care for so long. 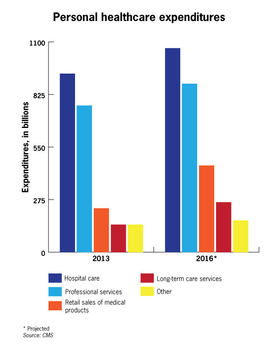 The spending growth of hospital care and physician and clinical services held steady below the 5.5% growth rate. Federal economists predict spending growth will be constrained in those areas, especially for physicians, as high-deductible plans lead to lower utilization. 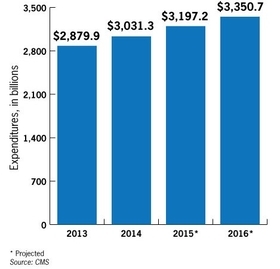 The amount spent on prescription drugs went up by 8.1% last year, CMS actuaries said. The $322 billion spent on prescription drugs in 2015 only includes retail pharmacies and excludes drugs dispensed through hospitals or doctors' offices. Those with private health insurance spent $5,380 per person last year, a 3.1% increase from 2014. Medicare paid almost $12,000 per enrollee in 2015, and that does not include what Medicare beneficiaries pay out of pocket. State Medicaid programs spent nearly $8,000 per member in 2015, a 5.7% year-over-year increase.